One more look downstream at the Morrison Bridge from the deck of the Hawthorne Bridge. The side spans are deck trusses and the approach spans are steel girders. As I mentioned, there are several ramps and connectors that carry vehicles from streets and expressways on and off this bridge. 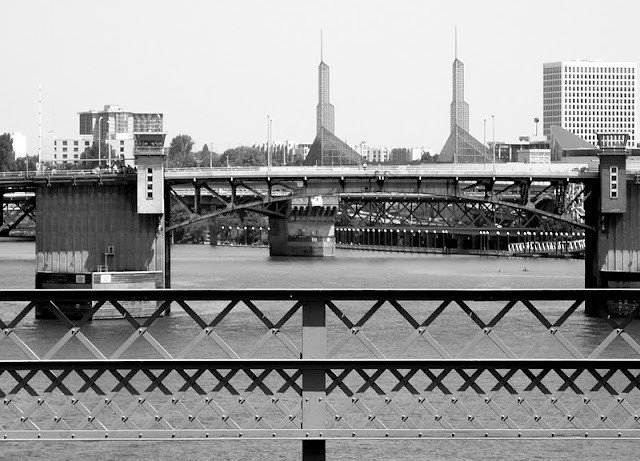 Like the other movable (non-railroad) Willamette River crossings, this bridge is owned by Multnomah County. The bascule span is usually opened once a day, which is fortunate since the roadway is so heavily traveled. There's about 69 ft of vertical clearance with the bridge closed. The machinery that performs this operation was manufactured by Northwest Marine and Iron Works of Portland and installed in 1957 by US Steel. It seems like movable bridges aren't built as often anymore, although some unusual movable footbridges have been built lately. Most bridge owners aren't willing to invest in the much higher operating and maintenance costs. The alternative would be long retaining walls or approach spans to lift the crossing high above the water. I'm not sure whether retaining walls or approach spans would be more expensive. It probably varies from place to place. Still, an approach span would be required whenever there are streets that must be crossed over. As I've previously mentioned, bridge building is a dangerous occupation. Construction of the Morrison Bridge took the life of a Mr. Davies when he was buried by a slide while checking footing reinforcement. Portland's Bridges: Morrison Bridge (2) by Mark Yashinsky is licensed under a Creative Commons Attribution-NonCommercial-ShareAlike 3.0 United States License.